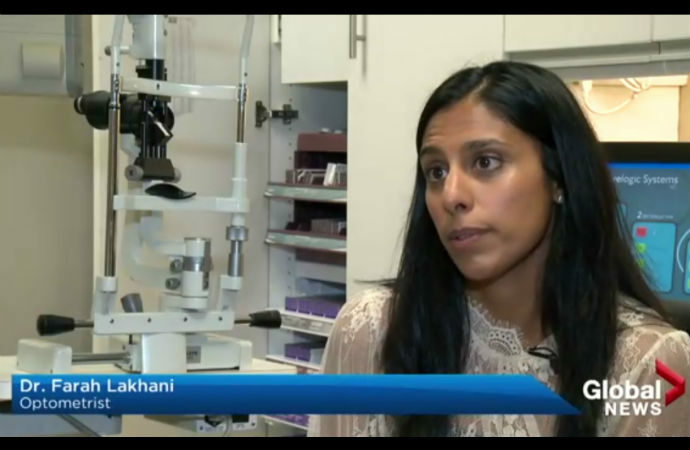 Dr. Farah Lakhani was interviewed about digital eye strain and how it affects children. The interview was conducted by Heather Yourex-West, a Global News reporter in Calgary. Heather: 10 year old James Sharkey loves football and soccer, but he also likes to play video games – sometimes for hours at a time. James: For the highest, 5 hours. Heather: Between home and school, the time children spend on digital devices is rising. Most kids are logging 4 to 8 hours a day. But all that screen time can be hard on young eye, leading to something optometrists refer to as digital eye strain. Dr. Farah Lakhani: Typical symptoms of digital eye strain include things like blurry vision, double vision, eye fatigue, excessive blinking. Heather: According to a recent survey by the Alberta Association of Optometrists, many parents aren’t aware that digital devices may be impacting their children’s eyes because the signs can be easy to miss. Dr. Farah Lakhani: Quite often in children these symptoms are very hard to detect and they often exhibit as irritability, poor behaviour, or reduced attention span in children. Heather: James’ mom started to suspect something was wrong when her son began complaining of headaches and was blinking excessively. Kathryn: He’d always worn glasses for some years, but I thought it was time for a new eye check. I’m glad we did take him because he was showing classic symptoms of digital eye strain. Heather: Doctors recommend parents promote the 20-20-20 rule. Ask that kids take a 20 second break every 20 minutes by looking at something at least 20 feet away. There are also treatments available. James now has a blue coating on his glasses to help reduce the blue light glare from phones and iPads. Kathryn: It’s made such a big difference to him, with lack of headaches now and there’s absolutely no blinking and it’s such such a difference. Do you suffer from digital eye strain? Our Optometrists can provide you with a customized solution to alleviate your symptoms. Click here to book an appointment.